One of Bucknell's most prominent scholars, Craig has a very diverse background in the geologic sciences and is one the country's leading geomorphologists, with significant contributions in hillslope, coastal, and fluvial processes. He has authored over fifty scientific papers and several books, including the top-ranked textbook Process Geomorphology. Craig not only helped create the the Susquehanna River Initiative in 2005, he also served as a faculty director of the Environmental Center, where he grew its vision and mission, emphasizing teaching, scholarship, and outreach. He remains a principle scientist in the River Initiative, contributing to its scholarship with new ideas and opportunities for collaborative research and with his colleagues on campus and across the world. A passionate scholar, Craig spends countless hours with students running physical modeling experiments in his flume laboratory or mapping and collecting data in watersheds throughout the United States and New Zealand. He continues to generate seminal findings on the impact of flooding and land use on stream channels. This work spans a geologic time scale, from the evolution of the Susquehanna drainage network, to glaciation and paleofloods during the Pleistocene, to the impact of logging, canal building, agriculture, and historical floods. 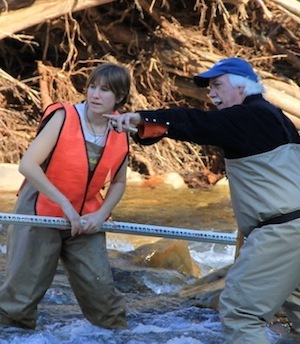 Over the past three decades at Bucknell and at Southern Illinois University at Carbondale, Craig has taught over a dozen watershed-related courses, but he is perhaps most proud of the ones he developed as part of the Susquehanna River Initiative. Having taught the first Natural History of the Susquehanna course in the mid-1990s, Craig was a lead instructor for the first Bucknell on the Susquehanna, a semester-long field intensive experience from the headwaters to the Chesapeake. 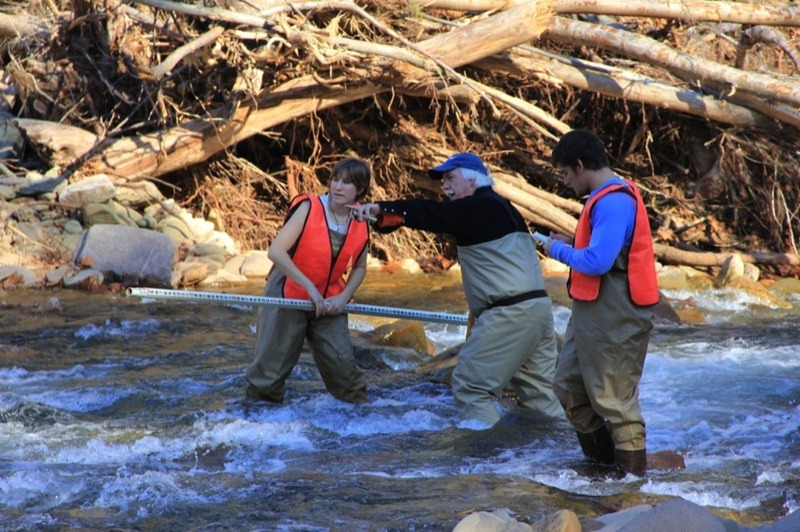 He also developed new courses on Stream Restoration and Watershed System Sciences. Frequently presenting the accomplishments of the River Initiative at regional and national meeting of scientific and engineering organizations, including the Geological Society of America (GSA), where he has served in leadership roles. He serves in scholarly roles with a number of agencies and watershed groups, including the Susquehanna River Basin Commission, Susquehanna River Heartland Coalition for Environmental Studies, U.S. Geological Survey, and Department of Environmental Protection. Craig is also an avid birder, paddler, gardener, and photographer. KOCHEL, R. C., and TROP, J.M., 2012. Active processes, morphology, and dynamics of icy debris fans: Landform evolution along rapidly degrading escarpments in alpine regions undergoing recent deglaciation, Geomorphology, 151–152 (2012) 59–76. R. Craig KOCHEL, Richard P. NICKELSEN a, L. Scott EATON, 2009. Catastrophic middle Pleistocene jökulhlaups in the upper Susquehanna River: Distinctive landforms from breakout floods in the central Appalachians, Geomorphology, 110 (2009) 80–95. RITTER,Dale F., KOCHEL, R. Craig, and MILLER, Jerry R., 2006, Process Geomorphology 4th edition : Long Grove, IL, Waveland Press, 546p. KOCHEL, R.C., and MILLER, J.R., 1997, editors, Geomorphic Effects of Minor Climate Changes: Geomorphology (special issue), v. 19, p. 171-368. Kochel, R.C., MILLER, J.R., and RITTER, D.F., 1997, Geomorphic response to minor cyclic climate changes, San Diego County, California: in Kochel, R.C., and Miller, J.R., eds., Geomorphology, v. 19, p. 277-302. KOCHEL, R.C., 1992, Floods, in Encyclopedia of Earth System Science, San Diego: Academic Press, p. 227-240. BAKER, V.R., KOCHEL, R.C., and PATTON, P.C., eds, 1988, Flood Geomorphology: New York, John Wiley, 503p. KOCHEL, R.C., RITTER, D.F., and MILLER, J.R., 1987, Role of tree dams in the construction of pseudo-terraces and variable geomorphic response to floods in Little River Valley, Virginia: Geology, v. 15, p. 718-721. KOCHEL, R.C., and BAKER, V.R., 1982, Paleoflood Hydrology: Science, v. 215, p. 353-361. KOCHEL, R.C., BAKER, V.R., and PATTON, P.C., 1982 Paleoflood hydrology of southwest Texas. Water Resources Research, v. 18, p. 1165-1183. MOSS, John H., and KOCHEL, R. Craig, 1978, Unexpected geomorphic effects of the Hurricane Agnes strom and flood, Conestoga drainage basin, southeastern Pennsylvania: Journal of Geology, v. 86, p. 1-11. KOCHEL, R. Craig and HAYES, Benjamin R., 2012. Catastrophic Flooding in North-Central Pennsylvania (Tropical Storm Lee - September 2011): Intersection of Fluvial Equilibrian and the Legacy of Logging, Paper No. 115-3 in the Special Session: The Fluvial System - The Legacy of Stanley A. Schumm (Invited Oral Session), Annual Meeting Geological Society of America, Charlotte, NC, November 4-7. KOCHEL, R. Craig; MUHLBAUER, Jason*; HANCOCK, Zachary*; ROCKWELL, Darin*; SIRIANNI, Matthew*, and HAYES, Benjamin, 2012. The “Gravel Flood”: Coarse-Grained Sediment Transport in Gravel Bed Streams During Tropical Storm Lee in North-Central Pennsylvania (September, 2011), Paper No. 168-7 in the Special Session: The Fluvial System - The Legacy of Stanley A. Schumm (Poster Session), Annual Meeting Geological Society of America, Charlotte, NC, November 4-7. MUHLBAUER, Jason* and KOCHEL, R. Craig, 2012. Catastrophic Flooding in North-Central Pennsylvania: Geomorphic Findings from the September 2011 Event and Their Significance to Sedimentology, Paper No. 168-8 in the Special Session: The Fluvial System - The Legacy of Stanley A. Schumm (Poster Session), Annual Meeting Geological Society of America, Charlotte, NC, November 4-7. HANCOCK, Zachary*; KOCHEL, R. Craig; MUHLBAUER, Jason*; ROCKWELL, Darin*; SIRIANNI, Matthew*, and HAYES, Benjamin, 2012. Geomorphic Impact of Catastrophic Flooding from Tropical Storm Lee (September, 2011) in Gravel-Bed Streams of the Appalachian Plateau, North-Central Pennsylvania, Paper No. 168-9 in the Special Session: The Fluvial System - The Legacy of Stanley A. Schumm (Poster Session), Annual Meeting Geological Society of America, Charlotte, NC, November 4-7. ROCKWELL, Darin*; KOCHEL, R. Craig; HANCOCK, Zachary*; SIRIANNI, Matthew*, and HAYES, Benjamin, 2012. Basin-Scale Influence on the Geomorphic Impacts of the Tropical Storm Lee Flood (September, 2011) in North-Central Pennsylvania, Paper No. 168-10 in the Special Session: The Fluvial System - The Legacy of Stanley A. Schumm (Poster Session), Annual Meeting Geological Society of America, Charlotte, NC, November 4-7. HAYES, Benjamin R. and KOCHEL, R. Craig, 2011. Impact of Logging Legacy Sediments and Geomorphic Adjustment on Stream Restoration Structures in North-Central Pennsylvania, Paper 23, Annual Water Resources Conference, American Water Resources Association, Philadelphia, PA, Nov. 1-4. HAYES, Benjamin R., KOCHEL, R. Craig, and KASSAB, Christine M.*, 2009. Assessing Long-Term Geomorphic Adjustment and Stream Restoration Structures in North-Central Pennsylvania, Geological Society of America Abstracts with Programs, Vol. 41, No. 7, p. 624. KOCHEL, R. C., MILLER, J.R., and HAYES, B.R., 2007. Limitations of the Use of In-Stream Structures in Stream Restoration : A Geomorphic Perspective. Abstracts with Programs, Mid-Atlantic Stream Restoration Conference, Canaan Valley Institute, Rocky Gap State Park, November 6–7, 2007.